Upper Deck’s SP Authentic Football “Super” Giveaway! Football fans are smiling as Upper Deck has released 2012 SP Authentic Football today! Get your box of 2012 SP Authentic Football today! We are looking for images of Upper Deck fans showing off their favorite Upper Deck SP Authentic Football cards from over the years. Take a photo of you and your Upper Deck SP Authentic Football cards and submit it to Upper Deck via email at UpperDeckMarketing@upperdeck.com, post it to our Facebook Page or hit us up on Twitter @UpperDeckSports. Include two sentences (no more, no less) as to why you love SP Authentic Football because it is almost Valentine’s Day after all. 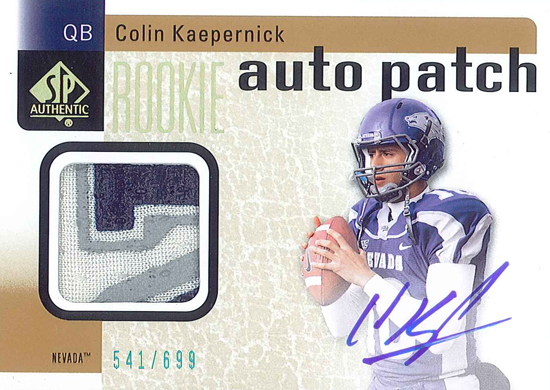 You can score this Colin Kaepernick rookie autograph patch card from SP Authentic AND the Joe Flacco SP rookie autograph patch card just for snapping a photo and sharing your thoughts with Upper Deck. You can post your images between now and Tuesday, February 5 at 10:00 a.m. Pacific. We will select the fan who most skillfully captures their love for the key components of the SP Authentic brand in their image and comments, while also taking a photo that shows their love for the game of Football. We will announce who will be receiving BOTH cards on Tuesday, February 5 in the afternoon. We are allowing a week for this promotion so you have plenty of time to get creative and you can even take your picture and post it during the big game or even the day after. So grab that camera phone, grab your favorite SP Authentic card(s) and get started. Share the love fans and you can really score! Chris…count me in…will submit something soon! i want this soo bad…i live football 100% of the time! go Rams!